Your bathroom is the one room you use several times a day. It’s also one of the easiest rooms to fill with clutter. From the towels to the toiletries you need an organizational system that works. Try these four tips as you keep your bathroom neat and tidy. Are you forced to carefully open your medicine cabinet because you’re afraid everything will pour out into the sink? Take back your medicine cabinet with a bit of organization. Start by tossing any outdated medicine and makeup. If it’s expired or smells funny, throw it away. As a quick guideline, eye makeup lasts six months, foundation often lasts a year and lipstick might last two years. You’ll also want to evaluate what you store in the cabinet. It might be the perfect size to store all your medicine but not your makeup. Or you might use it to store the items you use every day. Keep seldom used items in a bin or caddy under the sink. Remember to fold the cords loosely to prolong the life of your hair styling tools. Each person in your home only needs two sets of linens. Store them in a basket under the sink or in baskets on shelves. After you use a towel, hang it on a hook attached to the wall or bathroom door. All the shampoos, soaps and shower gels need to be stored somewhere other than the shower. Use a caddy to organize your shower toiletries. Hang the caddy over the showerhead or with suction cups to the back wall. You can also conserve space by using smaller bottles or using fewer products. Often overlooked, the walls, ceiling and door spaces offer convenient storage solutions. Consider storing cotton balls, toothbrushes and makeup brushes in baskets or in apothecary jars. Hang multilevel fruit baskets from the ceiling above the shower and near the sink. Hanging baskets are great for storing loofahs and other small shower essentials without clogging up your counters. The space above your toilet provides extra storage as well. Over the toilet, install a simple organizational piece. On the shelves of your newly installed furniture, stack baskets to store toilet paper, hide feminine products and stock extra toiletries. 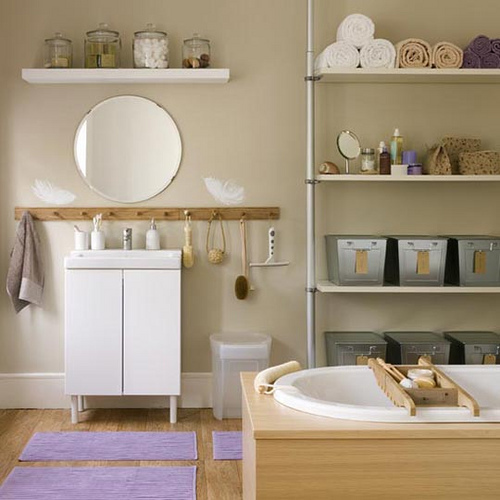 Take back your bathroom and contain the clutter with four organizational tips. No matter how often you use this essential room, it stays neat, tidy and clean when you organize it.